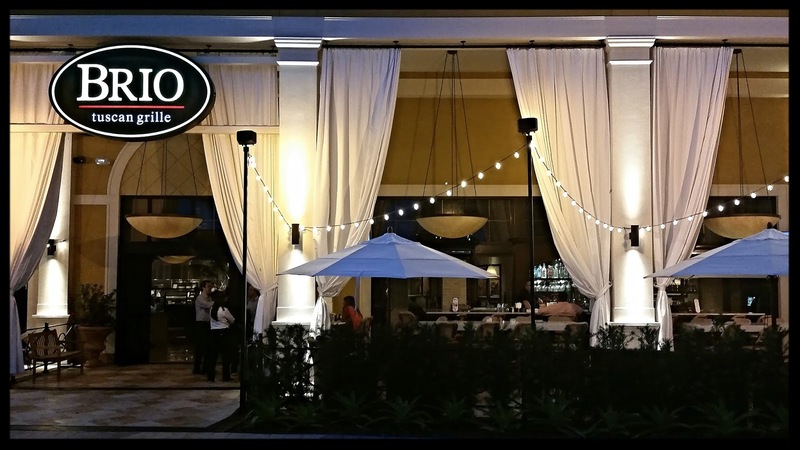 I have always been a fan of Brio Tuscan Grille and I have been to both Central Florida locations. Brio is really good at serving up consistent and authentic Italian food in what the restaurant deems as a “polished casual” atmosphere. 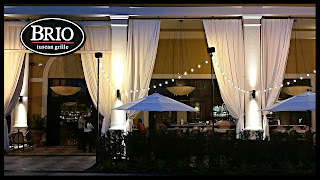 Recently on one of my many visits to Miami, which is my second home, by the way, I was invited to check out the newest Florida location of Brio Tuscan Grille at the Dolphin Mall, and of course I couldn't resist. In case you have not been to a Brio yet or are unfamiliar with the brand, Brio is part of Columbus based BRAVO|BRIO Restaurant Group (BBRG). Founded in 1992, BBRG currently operates more than 100 restaurants including Bravo Cucina Italiana, Brio Tuscan Grille, and Bon Vie Bistro. Brio Tuscan Grille serves up authentic northern Italian cuisine with a menu that features oven roasted steaks, chops, seafood, made-to-order pastas, flatbreads and entree salads, similar to what one would find in a ristorante in Tuscany. Brio also offers an ample dessert menu, and a full wine and cocktail list. Brio’s philosophy is “to eat well, is to live well”, and they strive to bring the pleasure of the Tuscan country villa to the American city. On Sept. 17, Brio Tuscan Grille, opened a location at the newly expanded wing of Dolphin Mall in Miami, Florida. The restaurant is the 14th location in Florida, and provides a “taste of Tuscany” to Miami-Dade’s largest retail shopping center. The beautiful new 7,500 square-foot Miami restaurant offers indoor seating for 226 guests, and al fresco dining for up to 89 on two Italian-style terraces. A private dining area accommodates groups for up to 40 guests. BRIO’s villa-like interior features details such as antique hardwood cypress flooring, arched colonnades, hand-crafted Italian mosaics, antique doors, hand crafted walls covered in an antique Venetian plaster, Arabescato marble-imported from Italy, and sizable wrought-iron chandeliers. I love a good calamari, but it’s hard to find somewhere that does it right. The Calamari Fritto Misto at Brio was Perfetto, as in Perfect. The calamari was a crispy golden brown and served with peperoncini, creamy aioli, and a nice pomodoro sauce for dipping. Bruschetta Quattro is perfect for sharing,or as a whole meal itself. You really can’t go wrong with a sampling of four housemade bruschettas. You get a Tomato Caprese Bruschetta, Sliced Steak Bruschetta, Roasted Red Pepper and Mozzarella Bruschetta and a Chicken Florentine Bruschetta. All of them were very delicious and quite tasty. The Pasta Fra Diavolo is composed of campanelle pasta, spicy tomato cream sauce, green onions and your choice of chicken or shrimp. The flavors in this pasta dish were intense and flavorful with the perfect amount of spice for the diavolo or devil in you that likes it hot! My dish of Chicken Milanese featured two generous portions of crispy Romano chicken, herb pasta and fresh Mozzarella in a housemade Pomodoro sauce. The Chicken Milanese is a rather simple and classic dish, but it is filled with exceptional flavor as the chicken cutlets are battered and fried to perfection. Brio means “lively” or “full of life” and that is certainly what you will find at any Brio Tuscan Grille location. As I said earlier, I really enjoy the Central Florida locations and Brio has proven to be very consistent across the board at every location I have been to. Of course it goes without saying, that in many parts of Miami and the surrounding areas, they have a reputation for being glitzy, glamorous, playful, and very stylish. The Dolphin Mall location certainly lives up to that billing, as it is everything you would expect from Brio, with a touch of Miami spice. Brio at Dolphin Mall is open seven days a week Sunday to Thursday from 11:30 a.m. to 10 p.m., Friday and Saturday from 11:30 a.m. to Midnight. 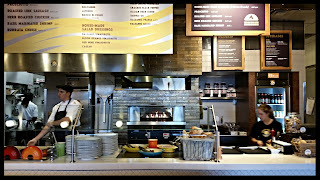 Spoleto is the newest arrival to the ever growing world of the “Fast Casual” dining experience. Fast Casual is a type of restaurant that does not offer full table service, but promises a higher quality of food with fewer frozen or processed ingredients than a fast-food restaurant. It is a concept that is positioned between fast food and casual dining. 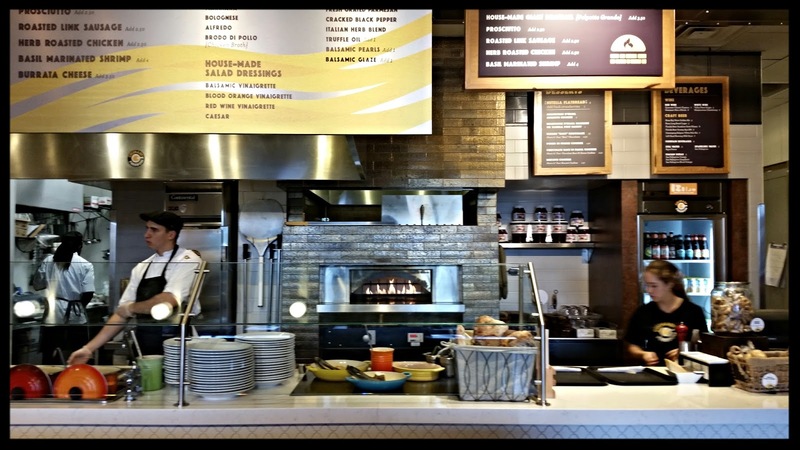 The typical cost per meal is $8-15 and is exemplified by chains such as Chipotle Mexican Grill Panera Bread. Guests dining at Spoleto will find a restaurant that combines the speed of fast casual service with the sophistication of an Italian restaurant with gourmet quality food. Spoleto further defines the uniqueness of the concept by offering a seasonal menu based on the availability of fresh local products and an endless number of guest selected food combinations. With a choice of over 25 authentic Italian inspired ingredients, it gives everyone a chance to create meals that inspire their palate. You can choose to indulge in richer ingredients like meats and cheeses, as well as a full complement of fresh vegetables, whole grains and fruits. All of this sounds great and looks even better in person, but it may be confusing to a first timer of Spoleto. As you enter the queue, your first choice is what type of pasta you would like, or if you want to customize a flatbread or salad. You then interact with someone behind a counter that tells you to pick six additional ingredients that will go into your dish. There are over twenty five additional ingredients to choose from and include things like broccoli, tomatoes, onion, sausage, kale and scallions to name a few. Don't feel bad if you give that person behind the counter a blank stare...it's a lot to take in on your first visit. Next you can choose an upgrade. If you go with just pasta, its about $8.00, and if you add a protein upgrade, you will add another couple of dollars to your tab. Upgrades include House Made Giant Meatball ($3.50), Prosciutto ($2.50), Roasted Link Sausage ($2.50), Herb Roasted Chicken ($2.50), and a Basil Marinated Shrimp for $4.00. Naturally your next decision will be what sauce you would like...choices include - Pesto, Marinara, Bolognese, Alfredo, Brodo di Pollo (chicken broth). Your final question is whether you would like to top off your creation with crushed red pepper, Parmesan, Italian herbs and a variety of other toppings. After you select a pasta, you can choose up to six of the twenty five plus additional ingredients. At Spoleto your ingredients are actually cooked together, and not just picked out of hot pans and mixed. The chef is always fun to watch and conversate with as he prepares your meal. I chose the penne pasta with bacon, truffle roasted mushrooms, tomatoes, caramelized onions, pepperoncini and Italian cheese blend as my six ingredients. I also added the house made meatball and topped it off with fresh grated Parmesan. This looked and tasted as good, if not better, then anything you may get at a traditional sit down restaurant and was ordered and ready in under 10 minutes. My guest chose the fettuccine with broccoli, carrots, pine nuts and sun roasted garlic and added the herb roasted chicken. You don't have to choose six ingredients, you may choose less, if you so wish. This dish was sauced with the Alfredo sauce and topped with fresh grated Parmesan and Italian herb blend. This was a perfect portion size and tasted wonderful. As an added bonus, and I must say “You have to try this,” we had the Nutella flat bread with fresh strawberries. This is very simple and quite understated, but the Nutella and the delicious flat bread taste like they were made for each other. Although the ordering system may be confusing at first, don't let that prevent you from trying out Spoleto. The food here is really good for fast casual Italian, and the number of dishes you can create is only limited by your imagination. The inside is very nice and open as well, and features open face brick and unique lighting fixtures made of cooking utensils. Spoleto : My Italian Kitchen is open from Monday - Sunday 11am - 10pm. Keep an eye out for the newest location to open up inside of the Florida Mall’s all new food pavilion, and a third location coming to Winter Park at 349 N. Orlando Avenue.